The perfect one-step refresh and make up remover. Natural extracts of Aloe vera and Green Tea help to soothe and nourish the skin, whilst Olus Oil keeps the skin moisturised. Perfect to quickly prepare skin in the morning or wipe away impurities at the end of the day. 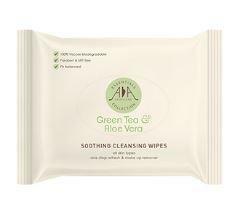 These gentle and soothing wipes are designed to leave the skin feeling cool, calm and refreshed. The perfect travel companion and gym bag essential. How to use: Gently wipe over eyes and face, twice daily, using both sides of wipe.